He always sat at the same table. First floor, side row, corner seat, close to the edge, overlooking the floor below. It offered everything he required. In order of his liking, the things his position offered were, privacy, ideal ventilation, a good view of the wall clock and an unobstructed view of anyone entering or leaving the library. He had followed his regular routine till now. Entered the library at 8am. As always, the first customer. The elderly librarian greeted him congenially. He never greeted back verbally. He just nodded. He had no requirement for pleasantries.He was a man in a shell and content with remaining within. The librarian knew him too well to have taken any offence. The old man just watched fondly as his favourite reader climbed up the spiral staircase and settled in his position. Everyone was aware of his reticent nature. Apart from his lack of concern for pleasantries and associated preference for monosyllables and reluctance to use his multisyllabic vocabulary, he did not give much reason for others to dislike him. He even displayed minor mannerisms that sort of made people fond of him over a period of time. The grocer liked him because he never haggled, the barber liked him because he was not fussy and quarrelsome about his haisrstyle, and his peers liked him because he was a handy and ready reference for long equations, tricky concepts and physical constants. The librarian of course liked him because he was the most regular reader for the past three years. In fact, a self-centred researcher rarely offers many reasons for anyone to really resent him. He had begun to settle down at his usual table. He had collected his stack of books for the day. Taking his writing instruments out of his bag, he laid them methodically beside the large stack. With his extravagant yet youthful and athletic frame, sitting hunched over the even larger stack of books, laying out his writing aids, he looked like a mental giant preparing itself for the bibliophilic feast that lay ahead. He held the pen over the paper, opened the book and was about to bite into his first nugget of knowledge when the blue umbrella entered his peripheral vision. He looked down at the ground floor library entrance and watched as the blue umbrella emerged from the drizzle outside and entered the library. He could not see the owner of the umbrella from his high position. He could just see the blue umbrella. Inspite of the fact that he could not see the owner, there was a strange attraction. The attraction had started with the blue umbrella. But it did not end when the blue umbrella was lowered and laid down to dry at the porch. His eyes moved effortlessly up the slender limb that was clutching it and opthalmically grazed the owner of the umbrella. The rest of the objects in his field of view receded as the enchantress took centre stage. He kept observing as she walked over to the librarian’s desk, took the form for new members and started filling it. She deposited the form, collected her new card and proceeded towards the newspaper section on the ground floor. Our bibliophile regained his senses and looked at the wall clock. It was almost 8:30am. It was the first time since he joined the library that he had spent more than 15 minutes inside the library looking at anything other than printed matter. He forced his attention back to the books but the blue umbrella kept tugging at it. He lost the tug of war when she came back later in the day. 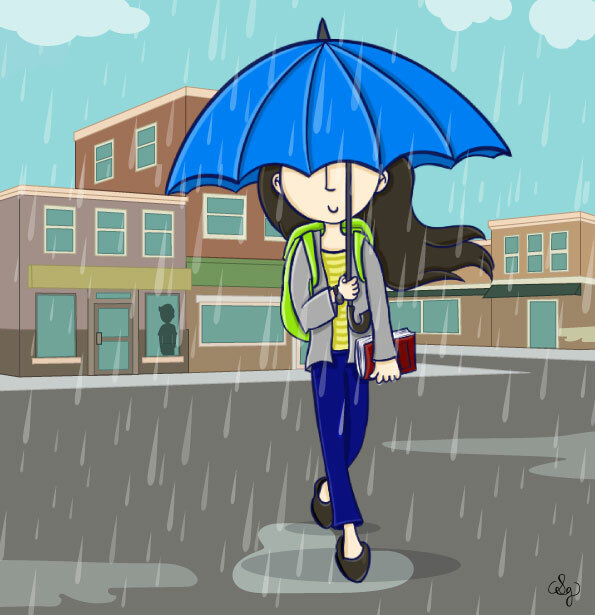 She picked up the blue umbrella and walked away gracefully. He followed her as far as rectilinear propagation of light allowed. As she walked out of the range of his view, he found himself wishing that he had the ability to bend rays of light. She became a daily visitor and our reader found himself looking at more than just books in the library. As the days went past he increasingly found himself searching for her with the same intensity with which he used to search for books in the library. He was enchanted. Enchanted with every aspect of her. Her long black hair, the captivating smile, the perfect features, the demure body language, the brown eyes that seemed to have the depth of the ocean in them. Everything about her was so fascinating. Even the blue umbrella. The heart was conquered. It took some time for the mind to accept it. Years of icy isolation had made him alien to the warm feelings in his heart. But the ice was thawing as he felt his heart get soaked in the caramel delight that is love. She proved herself to be a voracious reader. He involuntarily monitored her reading habits closely and admired her diverse taste in books. Her changing reading habits started bringing her to the first floor. As a side-effect, he suddenly found himself spending gradually increasing amounts of time in front of the mirror before coming to the library. One fine day, he saw his lady love unsuccessfully looking for a particular book on his floor. She decided to ask for help and proceeded by approaching the reader closest to the stairs. The reader did not seem to know the location of the book she was looking for. She made her way along the row to the next reader. Again, a negative answer. She inched her way closer and closer, one desk at a time, towards her secret admirer in the corner seat. The closer she came, the faster his heart started beating. He almost leapt with joy as he heard the title of the book she was looking for her. He knew precisely where it was. He fumbled mentally to frame the sentence with which he would direct her. He checked his breath. Straightened his hair. Cleared his throat. He began to weigh whether he should accompany her to the shelf? Would it seem too eager? Is it too early to ask her out for coffee? He was relieved off all his dilemmas as the reader next to him directed her to the appropriate shelf and halted her progress along the row. For the first time in 3 years of being a member of the library, he felt like picking up his book and throwing it at a fellow reader. He prided himself at never relying on chance. So, he never admitted even to himself, let alone anybody else, that he was secretly, desperately praying for another similar but successful encounter. The confectionary shop next to the library perceived an increase in the sale of mouth fresheners. For the next considerable number of days, she seemed to require no assistance in locating the books she required. The love addict began to find that the daily visual drug delivery dosage was no longer enough to satiate his cardiac cravings. He was unable to focus on his work like he used to and there was a backlog of pending work beginning to build up. The trouble with a brain with above average IQ is that, it meddles in the affairs of the heart. This brain had started plotting ways to achieve what his heart desired. That morning, he stood in front of the mirror and looked at himself. There was nothing repulsive there. In fact the image was quite easy on the eye. Broad intellectual forehead, clearly demarcated eye brows, deep-set and apparently intelligent eyes. The few wrinkles around the eyes were more from poring over books for endless hours rather than age. Overall he made a pleasing sight with the luxuriant, black, slightly unkempt hair and thick spectacles giving him an erudite air. The rest of the generous torso provided an illusion of athletic ability. He did make an eye catching scene. He assured himself that he was good looking, gentle and kind, good hearted, well mannered, thoroughly sophisticated and a complete gentleman, all veiled behind the curtain of awkward nerdiness. He prepared his mind to cross the energy barrier that was normal social interaction with the girl he had a crush on. He tried to convince himself that he had the potential to cross the barrier. Whenever any doubts crept, he reminded himself of the probability of quantum tunneling and proceeded towards the library. He planned to initiate a conversation with her on her way out of the library. It was a Friday. He would ask her plans for the weekend and ask her if she would like to spend it in his company. The lines were well rehearsed. The logistics were thought out well in advance. Only the execution remained. He sat at his desk, quietly, waiting for evening, crouched like a tiger, ready to pounce on the prey of opportunity when she walks out of the library. He itched to reveal his newly acquired claws of witty, well-rehearsed pick-up lines and snare his prey. Dusk set in, accompanied by a light drizzle. He saw her come to the desk, and issue her books for the day. The romeo tiger licked its lips in anticipation. The adrenaline began to flow and his heart rate increased. It was time to move in for the kill. He bounded down the stairs. That was when he saw the blue umbrella walking away into the distance. She was moving faster than he expected her to. He would have made a dash for it and caught up with her, had he not seen the black umbrella move up next to his beloved blue umbrella. He watched helplessly from the distance as the two umbrellas came too close for his comfort. His dreams and hopes came crashing down, pain pierced his heart and try as he might he could not prevent the tears from welling up in his eyes. Unable to clearly see the owners of the two umbrellas, he could just watch as the two circles of the umbrellas overlapped and trailed off into the dusky darkness like a Venn diagram. Heartbroken, the tiger morphed into a cat and started walking back home alone in the rain. His prey had walked off with the hyena. A heartbreak can inspire a man to great works. Heartbroken, poets create romantic poems, musicians dole out soulful music, artists paint their most beautiful works, athletes wear out punching bags. But, what could our scientist do? He delves deep into the mathematical aspects of quantum phenomena. In an attempt to bury his personal anguish under the weight of academic workload, he locked himself up and accomplished all the tasks that had been pending since he caught the love bug. Not resting even after catching up with the backlog, he zoomed ahead of his schedule and left his peers awestruck with his progress. In fact, he himself was amazed at the focus and untiring effort he was able to muster for the past couple of days. Couple more heartbreaks and he would be right on track to win a Nobel Prize. The long weekend finally came to an end. The weekend that he intended to be the most romantic weekend of his life had turned out to be the most academically productive weekend of his life. He couldn’t resist a smirk at the irony of it all as he dressed up that Monday morning and proceeded to his usual haunt, the library. The same library that gave him so much and yet, took away, even more than it had given. The cold and misty morning seemed to make his bones ache almost as much as his heart was aching. He walked slowly towards the library entrance. Visibility was low due to the mist but he could recognise her through it all. She was standing there near the notice board. She was pinning up something to the board. “What now? Her marriage invitation to the public?” thought our irrational nerd. She pushed the final pin into the notice and he imagined it to be the final nail in the coffin of his love. She walked into the library and towards the newspaper section. He proceeded to read the notice more out of morbid curiosity than anything else. Few seconds later, the old librarian heard heavy thuds of rushing footsteps and saw his favourite bookworm, the usually calm scientist barge into the library and run frantically towards the newspaper section. The librarian had never known the scientist to ever even walk in a hurried manner let alone sprint in this frenzied manner. What devil could have resulted in this unusual sight? The librarian could not control his curiosity. He left his desk and proceeded to read the notice that had had resulted in this hyperactive state of the usually sedate scientist. That was where our lover had abruptly stopped reading the notice and began his mad dash into the library towards his lady love. The librarian still spends his time wondering how a simple notice of a lost blue umbrella could produce such a pronounced change of behaviour in his favourite bookworm. Amazing read… 🙂 Loved it.